When I joined AFP South Sound almost six years ago, I told myself to not get too involved. I had only recently started at Hilltop Artists and just excused myself from a number of volunteer projects because I had too much on my plate. Alas, saying "yes" to coffee turned into joining the Young Professionals committee. From there, I ended up on the Marketing Committee, where I served as Chair for almost three years. This past year, I chaired the Membership Committee. And now, I'm Chapter President. Let me explain. When I joined AFP South Sound, I discovered a network of thoughtful, intelligent, and hard-working professionals — the kind of people I wanted to be like and liked to be around. The educational programs gave me many useful tools, but I also learned so much from my fellow committee members and truly enjoyed their company. I am inspired by our members who are doing amazing and wonderful things to make our world a better place. Perhaps you find yourself in a place where you could use some renewed energy and inspired wisdom from your peers. Or maybe you have some ideas and/or feedback about where you would like see our chapter go over the next year. If so, please email me at kward@hilltopartist.org and we can grab coffee. I look forward to this coming year as our Chapter President because it gives me a meaningful way to give back to this organization that has done so much for me. Thank you! Kate Albert Ward currently serves as the Deputy Director at Hilltop Artists, where she has the opportunity to combine her passions for art, community, education, and social justice. 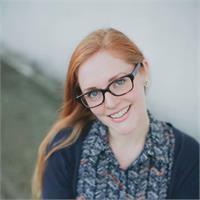 Born and raised in Tacoma, Kate has volunteered many places over the years, but counts serving on the staff of Camp Goodtimes, a pediatric oncology camp on Vashon Island, and as a founding editor for Post Defiance among the highlights. Prior work experience includes at Tacoma Arts Live (formerly Broadway Center for the Performing Arts), Portland Art Museum, and Museum of Glass. Kate received her masters degree from the Williams College Graduate Program in the History of Art and an undergraduate degree from University of Washington. You will make an awesome AFPSS President, Kate! I look forward to seeing all the wonderful things we will accomplish this year as a result of your enthusiastic and attentive leadership. Thank you for stepping up!